If there can be only one tribute to the legendary SLS, the last of its kind to feature a naturally aspirated engine, let it be this one. 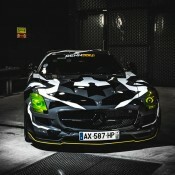 This arctic camo-wrapped RENNtech Mercedes SLS is the perfect showcase of the car’s playful character. 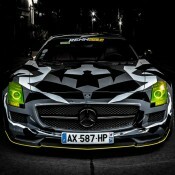 The SLS is like a kind, simple-minded giant… kind of like Lennie in of Mice and Men. Come to think of it, just like the Lennie of the story, you want to be careful with the SLS because the moment you let it off the leash it can go wild and hurt you. 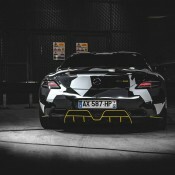 That is especially the case with the RENNtech Mercedes SLS as it features a power upgrade kit with custom ECU software, stainless steel exhaust system and longtube headers for a total of 603 horsepower and 510 lb-ft of torque. 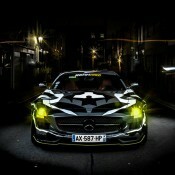 But performance is only one part of what makes this RENNtech Mercedes SLS the ideal tribute to the iconic model. 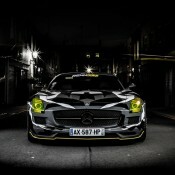 The car also feature customized looks with a front splitter, side rocker panels, and rear diffuser, all of which have yellow accents to match the yellow headlights. And the reason this car has yellow headlights is due to the whole arctic camp wrap thing which is done by Siyara Automotive. We can’t say the wrap is entirely cool, but it sure is fascinating and quite a bit different than what we’re used to seeing these days. 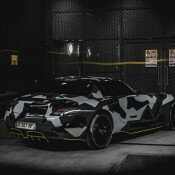 The post RENNtech Mercedes SLS with Arctic Camo Wrap appeared first on Motorward.